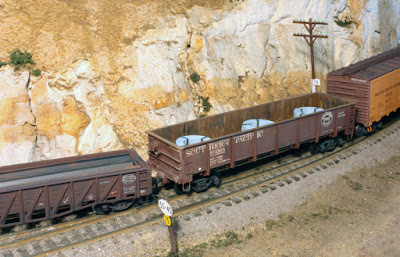 Awhile back, I showed the calculations I have done for some of my open car loads, including one load of steel bar that would be too heavy for a 50-ton car, but would have to move in a 70-ton car (that post can be seen at: http://modelingthesp.blogspot.com/2016/11/open-car-loads-weight.html ). In the present post, I want to continue this topic. I will paint the coil steel gray (a bluish-gray color) and paint the strapping black. Just to illustrate, here are the dimensions of one of these coils in scale feet and inches. The outer diameter is 6' 3" and the inner diameter is 3' 7", with a height of the coil at 2' 9". One can readily calculate the gross surface area of the entire top of the cylinder, and subtract the inner diameter or hole, to get the net area of the circular coil. Then multiplying by the height gives the volume in cubic feet, which I obtain as 56.6 cubic feet. Since the density of steel is 490 pounds per cubic foot, the weight of one of these coils would be 27,750 pounds. I have three of the coils, which looks a little sparse in a 40-foot gondola, but in fact three of them would weigh 83,250 pounds, quite a respectable load for a 50-ton car. Here are those three coils in a gondola. In the foreground you may note one of SP’s standard speed signs. I have discussed those signs in a prior post, and shown this specific sign (see that post at: http://modelingthesp.blogspot.com/2014/03/speed-signs.html ). As the milepost on the phone pole in the background indicates, this is mile 270 on the Coast Route. In another previous post, I described the SP standards for such signs, and showed this one in place (the post can be found at: http://modelingthesp.blogspot.com/2014/03/milepost-markers.html ). Another example is one of the excellent Duha loads from the Czech Republic (these have been imported for several years now by JWD Premium Products in Maine). It appears to be represented as steel plates, about 2 scale inches thick, with five longer plates and two shorter plates, the latter also a little narrower. What appear to be 2-inch plates may be intended as pairs of 1-inch plates, or even packs of thinner sheet. But for calculating density, it doesn’t much matter. Here is its appearance. The sag in the upper stack does suggest sheet rather than 2-inch plate. 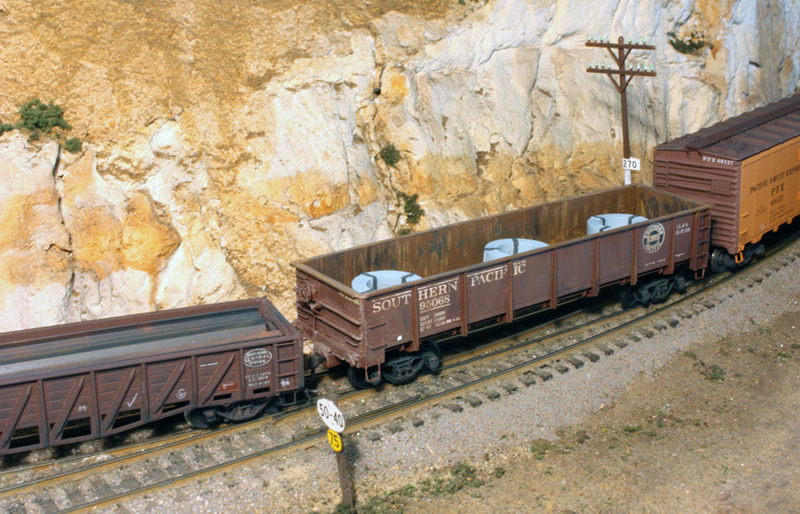 One can readily measure the plate (or sheet stack) thickness, then the plan dimensions, all in inches, multiply by 87 to obtain HO scale dimensions, then multiply dimensions together to get the volume of each plate in scale cubic inches. Then using the handbook density of steel, 0.2904 pounds per cubic inch. one arrives at the total weight of each plate. The long plates weigh 21,000 pounds and the short plates about 12,500 pounds. This makes the total weight of this load about 125,000 pounds. This is just above the typical load limit of SP 40-foot gondolas, which was about 119,000 pounds. Thus such a plate load should either be placed in 70-ton gondolas, or else on 50-ton flat cars, which usually have a load limit more like 130,000 pounds. Most loads for open-top cars would not have weight issues, but when masses of steel are depicted, it seems to me worth checking what the actual weight of such a load might be. When the load is too heavy for some cars, I simply restrict use of that load to appropriate cars. But this Duha load is a good illustration of an obvious point: since it’s a great-looking load, many modelers will be happy to put it in whatever car they have handy. Interestingly I still see coils of steel being shipped in open gondolas through my area. There is a steel pipe fabricator in Baton Rouge (several miles east of my location) that often receives it's steel via the Canadian National line (formerly the Illinois Central) from somewhere up north. I confess that I've not paid enough attention to the loads to ascertain their size, but they are shipped two to the car, one over each truck. The cars are generally about 50' length, but again, I haven't taken notes as to their capacity, or even their exact length. I see these only sporadically, but if I'm close enough on the next encounter, I'll try to glean more details about the loads (and cars). The prototype has not always been as careful as you are! In the early days of double-stack container moves, there was a shipment of coil steel in a 20' container that was not properly blocked and went right through the floor of the container and the open bottom of the stack car, causing a massive derailment. There are now light cross-members on the bottom of stack cars largely for this reason.